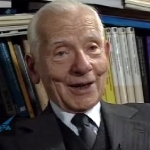 Video recorded in 2002, three years before his death scientist and Nobel Peace Laureate Sir Joseph Rotblat discusses his life and his work in an interview with Sir Harry Kroto and Edward Goldwyn. This rare footage is part of a series of unedited tapes making one complete interview which was completed in 2005 in interview 2. In this video Joseph Rotblat speaks about the period he spent at Los Alamos. Shock of finding out the bomb was being developed to subdue the Russians. Germany gave up occupation and difficulty in leaving the project. Accused of being a spy. Experimental physics - Syncrotron Group - scattering and fission process. Story of his accident while working on the Syncrotron, exposure to radiation, sickness and effects of exposure. 200 scientists work at Los Alomos.